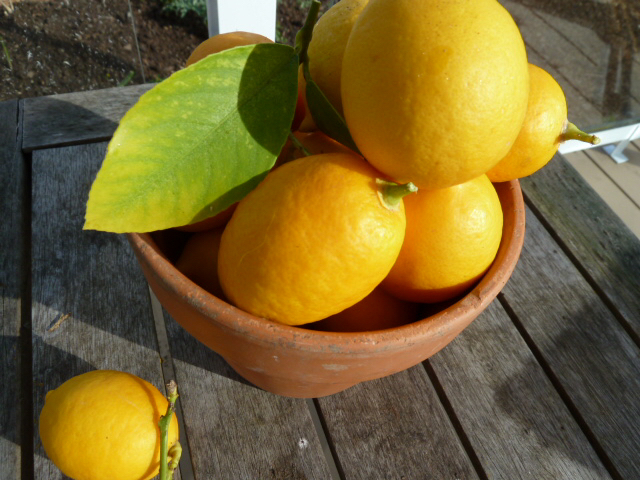 This was the latest batch of Meyer Lemons from my tree. They have now been juiced, frozen in ice cube trays and bagged in the freezer. I think I finally figured out why the leaves on the lemon and lime trees have been so yellow. I will do a post about it shortly. Hi George!! Here's what happened with mine. I put it in a large pot when I got it as it was a good sized tree, the first year it was gorgeous. Then...it started turning almost white. I found out it had tiny spider mites. See this post for pictures. http://www.erinmiddlebrooks.com/2014/05/meyer-lemon-update.html So I put a misting nozzle on the hose and blasted the leaves, especially the underside. It only took a month or so until I saw very few. And I started fertilizing like mad. The leaves turned a pale green but never got deep green. The next year it was turning so yellow I thought it was going to die. A few weeks ago I took a good look at both the lemon and lime and noticed how large the top was compared to the pot size. The top was about 4+ maybe five feet across. Light bulb!!! I took off the few lemons and pruned it back hard. Really hard. The trees are about two feet across at the top. Mine are trees with a trunk, so I made the giant head about two feet in total. George they are COVERED with hundreds of new leaf shoots everywhere and a nice green. So I am going to fertilize on the weekend and take photos for a post. I will keep this updated.